Cast: Ashton Kutcher, Amanda Peet, Taryn Manning, Aimee Garcia, Ali Larter. Story: Two people have a dalliance on a plane that lasts longer than they expect. Running Time: 1hr 47 minutes. A Lot Like Love is, in fact, A Lot Like Lots of other mundane movies of the ilk. Lightly amusing in places, lightly dull in others, it's your average assembly line romantic comedy. Films tend to get commissioned, if the movies are to be believed, by people pitching ideas at the boss and making them stick. If that's true, I'd love to see the pitch for this one. "Well, it's about two people who hook up and then over a period of years, keep hooking up again and again and ... er ... there's a deaf brother in it ... urm ... did I mention they hook up?" That's it. That's all that happens. They try and fling a curve ball at the end, but it's so blindingly obvious that the viewer smacks it out the park before it's left the pitcher's hand. So this is a movie all about the relationship between Kutcher and Peet and, I have to grudgingly admit, it does hold the interest despite the lack of a discernible plot, thanks to some decent dialogue and entertaining leads. Ashton Kutcher seems an unlikely romantic lead. Having played in The Butterfly Effect and Guess Who, but perhaps best known for his MTV series Punk'd (and for porking Demi Moore), he's not most people's first choice. I have to give him credit though, he's actually not bad here, showing a subtlety and sensitivity I didn't expect from him. 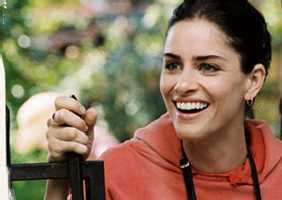 He's comprehensively outshone by Amanda Peet though (from The Whole Nine / Ten Yards), who creates most of the chemistry. The fact that the two of them are watchable for nearly two hours doing nothing more than amiable courting is a testament to their abilities, if not to the durability of the script. At the end of the year, I doubt I'll remember the title of this one, let alone the finer points of the romance. Seeing A Lot Like Love is like going to an Indian and ordering something mild. It fills you up and doesn't taste bad, but it misses the point of choosing that kind of food in the first place. It's nice and fluffy and will make you go "awww" if you're that way inclined, but its lack of substance will make it leave your memory quicker than a Big Brother contestant. Testosterone Satisfaction Rating: 1/5 All we get is Amanda Peet's bum from a long way away. To enjoy this film you should be: looking for a pleasant evening and no more. A Lot Like Love is on general release in the UK now.